Beauty DNA is a new skincare, body and hair product subscription service that offers super customization to ensure that you get the best products personalized for you every month. You fill out a really in-depth profile about yourself and your product needs. Then, using a complicated algorithm, Beauty DNA matches you with a product that fits your profile. They send you a new product every month and you can update your profile at any point to reflect your changing needs and preferences. The total cost for the product and shipping is $25 a month. I was really excited to try this subscription out as I hate spending exorbitant amounts of money on skincare products that I feel have been overly hyped by a sales rep. These products almost never actually work for me and my skin needs and the price tags associated with them can be a downer. After trying out the service, I have to say I’m pleasantly surprised. I had a small snafu with actually getting my products as my box was one of seven, I believe, to have had some kind of shipping error so that it actually took several weeks to match me and send my box along. However, I thought the Customer Service was awesome. I spoke with Beauty DNA rep Whitney a couple of times to ensure that my products were still coming to me and when I could expect them to arrive. What I thought was truly awesome is that she didn’t give me the standard Customer Service phone number to call. It was a direct line to her that I could give a quick ring to when I needed an assurance that I was still getting my box and that it would arrive soon. I was anxiously waiting to try out some new skincare products as my skin was having a major freakout at the time. After all the delays, Whitney was nice enough to overnight my box so that I could finally get my hands on my new products! Thanks Whitney! I received two products in my first Beauty DNA box. My first product was the Avène USA Cleanance Lotion. (valued at $24) It’s a light weight moisturizer for blemish prone skin that mattifies and keeps your skin shine free throughout the day by absorbing excess oil. I have used this moisturizer for about a week now and I think it’s a definite winner. It goes on really smoothly and has a light rose scent. It absorbs SUPER well and makes my skin feel much healtheir. It has become a new staple in my skincare routine. 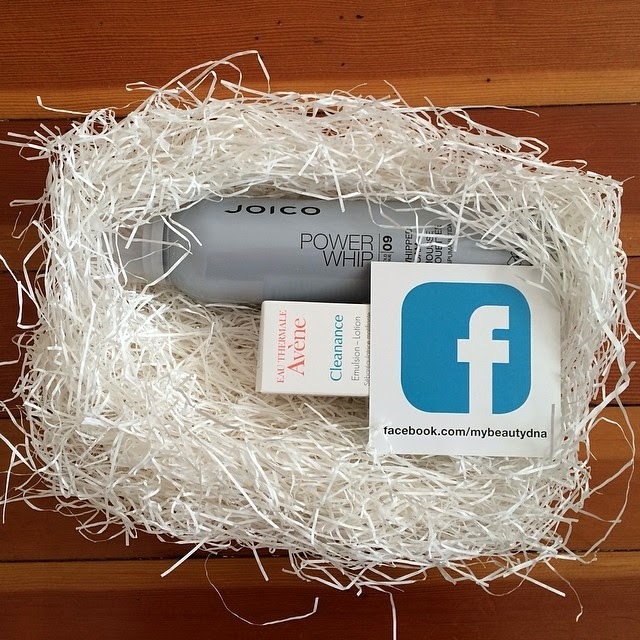 The second product I received was a bonus product, a volumizing Power Whip mousse from Joico (valued at $16). Unfortunately, this product was a major miss for me. It may have been my application, but the mousse made my hair feel extremely crunchy and sticky. I actually ended up rewashing my hair to try and get most of it out. This was a sad revelation for me because I had just run out of volumizing mousse and was excited to try another brand! Overall, I am really enjoying Beauty DNA and will continue to subscribe for as long as my match-ups continue to be as awesome as my new moisturizer! My only two suggestions for them would be to let the user ask for a specific product type each month as our needs tend to differentiate. Currently, I’m on the hunt for a great serum for my skin and I wish there was a request area where I could mention that or tell them that, in the month of May, i’d really like a great smelling moisturizer with SPF! Another suggestion would be to keep a list on our account profiles of products we’ve received in the past and a way to re-purchase them through Beauty DNA! Perhaps, they can implement something in the future! In the meantime, I can’t wait to see what they have coming for me this month! Thanks for your review. Do you still have their number; can't find it on the web site. This month's product really was off the mark.